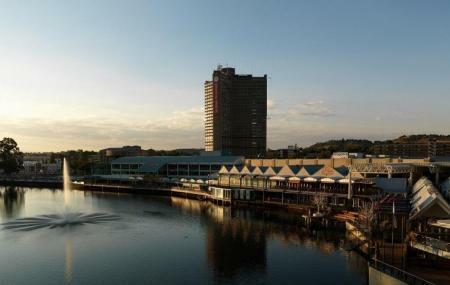 The largest shopping centre in central South Africa, Loch Logan Waterfront is a favourite among the locals as well as the visitors. Here you have everything, from shopping and entertainment to sport and culture. Located here are more than 100 shops, 17 restaurants and coffee shops, 10 fast food outlets, movies, salons, banks, a gym and a medical centre. If you are tired shopping or walking those long paths inside the shopping mall, you can visit the waterfront, grab a cup of coffee and spend some quiet time. This shopping mall is a one-stop shop for every member of your family. The food court here offers a wide variety of local and global cuisine. Also situated close to this mall are a few attractions like: Free State Rugby Stadium "Vodacom Park", the Free State Cricket Stadium "Outsurance Oval", the Sand du Plessis Theatre, the Bloemfontein Medi-Clinic, the Bloemfontein Rose gardens, the Central University of Technology, and the Provincial Government Buildings. Timing for Monday to Friday: 09.00 am to 06.00 pm. Timing for Saturday: 08.30 am to 05.00 pm. Timing for Sundays and public holidays: 10.00 am to 02.00 pm. The schedule and timings for various shops, exhibitions and movie show times is variable. How popular is Loch Logan Waterfront? People normally club together The National Museum and Anglo Boer War Museum while planning their visit to Loch Logan Waterfront. Not world-class. Shops are adequate. Restaurants are nothing special. Average cinema. The quality of the overall experience in the shopping mall is not improving. The water has become ugly to look at and smells unpleasant. Less of a waterfront than it once was. Nice place to go with friends and family. You can have a nice and relaxed day, eat in one of the restaurants near the water but also if you search for something specific to buy you'll probably find it in the mall. Always being a fan of the Waterfront! Great shopping experience and wide variety of shops.